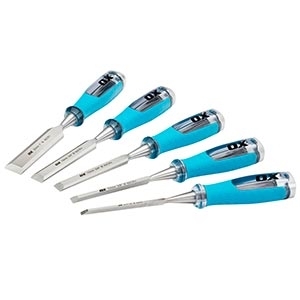 Here at SGS, we sell professional standard chisels and chisel sets made by the prestigious OX Tools, which you can browse below. Known for being exceptionally dependable, reliable and fit for purpose, you can be sure that our range of OX chisels and chisel sets won’t let you down. Ox Tools OX-P092501 Pro Concrete Chisel 3/4" x 12"
A builder’s chisel must have a firm grip to do an effective job, and OX chisels excel in this department. Our 5-piece wood chisel set, which includes chisels which are 6mm, 13mm, 19mm, 25mm and 32mm, also gives you a lot of variety if you want a number of different sized chisels for different tasks. A bricklayer’s chisel is of paramount importance for any brick related work, so there’s no need to settle for anything but the best. We’re confident that any of our selection will be a welcome addition to your tool box, so be sure to shop at SGS for the very best in bricklaying tools and equipment. When you buy from SGS, you’ll find you have access to a great range of benefits which put us ahead of competitors. With a 60 day returns policy and free next day delivery option, you can be sure that you’re getting a good deal when you buy from us.